With just a few days away from Christmas and New Year's countdown has already started, we cannot deny that 2018 is surely a rough year and a roller-coaster ride for Filipinos with the challenges and ups-and-downs it has brought. However, once the '-ber months,' specially the month of December, has come, it feels like all the problems will be washed away automatically and all you can feel is the goodness of giving and love. This year, Eden Cheese highlights this Filipino attitude. 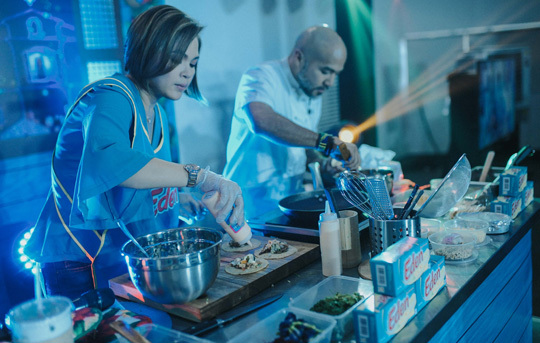 Through its Christmas campaign entitled #GiveGoodnessWithEden launched recently at One Canvas Events Place in Makati City, ambassadors Judy Ann Santos-Agoncillo and renowned Chef JP Anglo shared Christmas dishes that can be shared with the people we love like Carbonara, Caldereta, and Leche Flan in a cooking demo. To add some goodness with its taste, Eden Cheese is added to its list of ingredients. This Christmas, we can start by sharing something good to people around us. With Eden’s delicious blend of cheese and milk taste, it can fill any dish with goodness and there is no better way to enjoy it than by sharing it with others. Eden has been part of Filipino families for decades and it aims to inspire the community. Despite the tough times where the cost of living may be on the rise, Eden believes that in the end, the naturally giving spirit of Filipinos or inherent bayanihan will shine. “Showing goodness does not have to mean making elaborate gestures. It can mean making heartfelt actions to share something good with the people in your life. In today’s hectic and confusing world, we can all give a little goodness. This Christmas, Eden inspires everyone to give goodness-not just by filling people’s tummies, but by filling people’s hearts,” Anna Sapitan, the Category Manager for Meals of Mondelez Philippines, the maker of Eden Cheese, mused about the campaign.